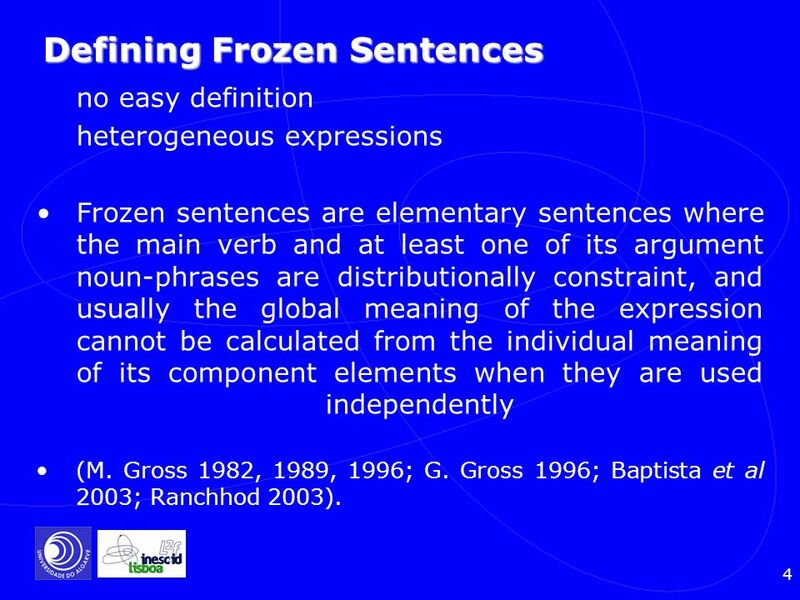 Many frozen sentences, especially those that are most usual or most obviously idiomatic, have already been collected both in general and in specialized dictionaries of ‘idioms’. 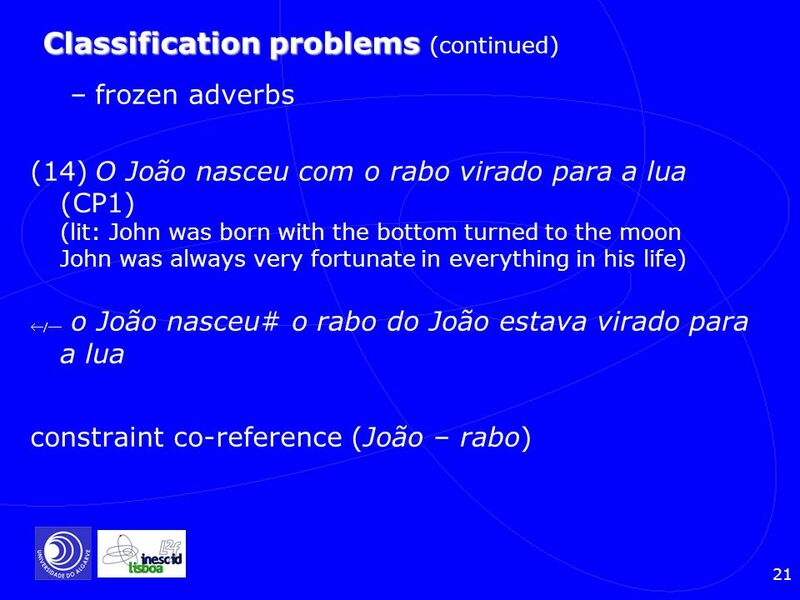 In these dictionaries, frozen sentences are usually undistinguished from other types of multiword expressions, such as compound nouns, adverbs, prepositions and conjunctions; proverbs, etc. 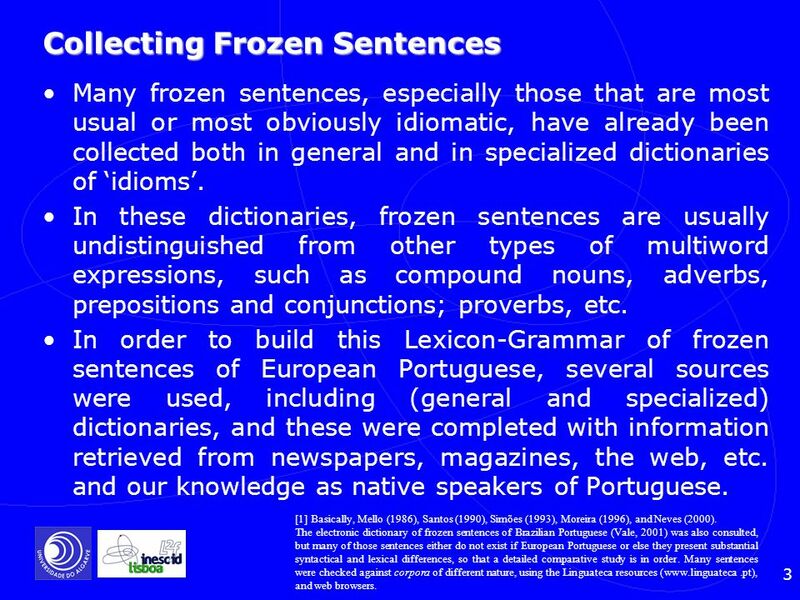 In order to build this Lexicon-Grammar of frozen sentences of European Portuguese, several sources were used, including (general and specialized) dictionaries, and these were completed with information retrieved from newspapers, magazines, the web, etc. 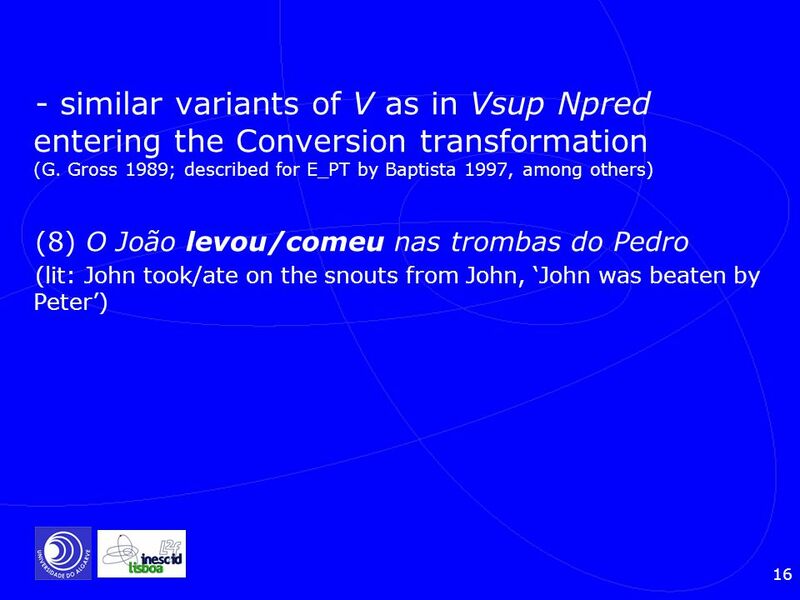 and our knowledge as native speakers of Portuguese. 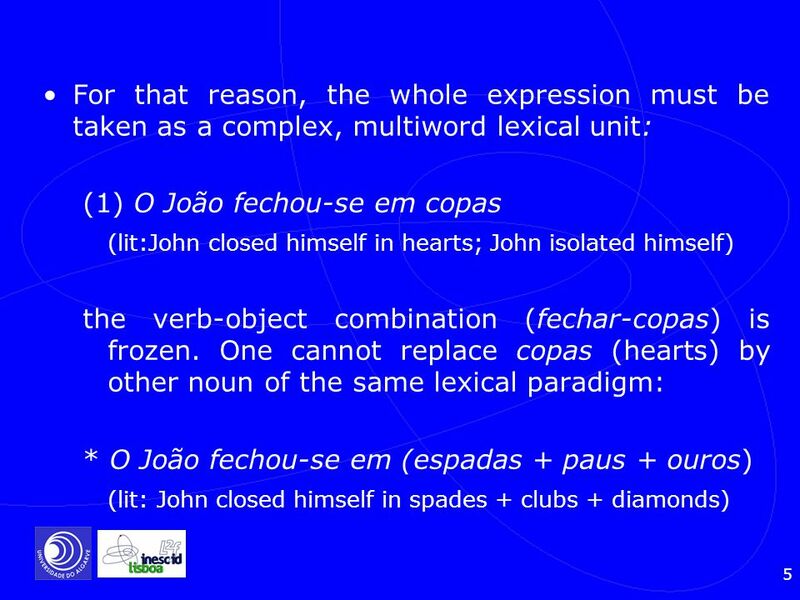 Basically, Mello (1986), Santos (1990), Simões (1993), Moreira (1996), and Neves (2000). 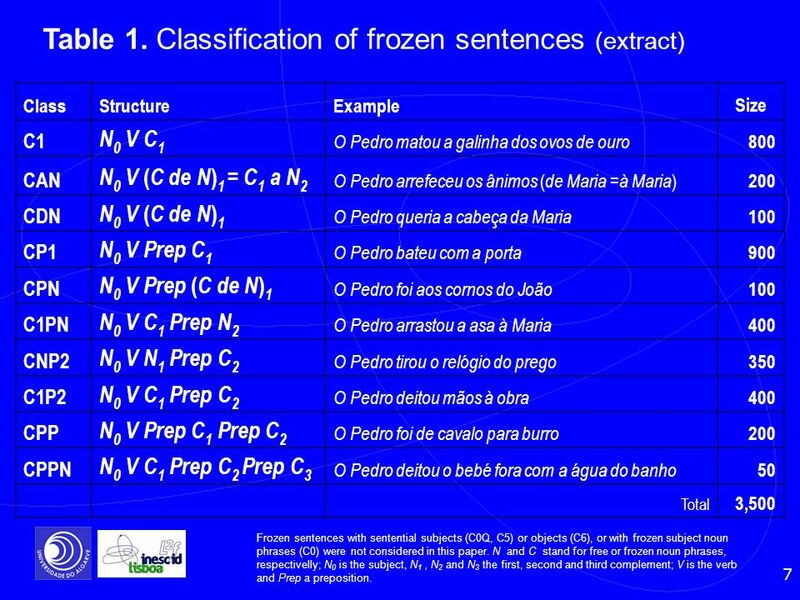 The electronic dictionary of frozen sentences of Brazilian Portuguese (Vale, 2001) was also consulted, but many of those sentences either do not exist if European Portuguese or else they present substantial syntactical and lexical differences, so that a detailed comparative study is in order. 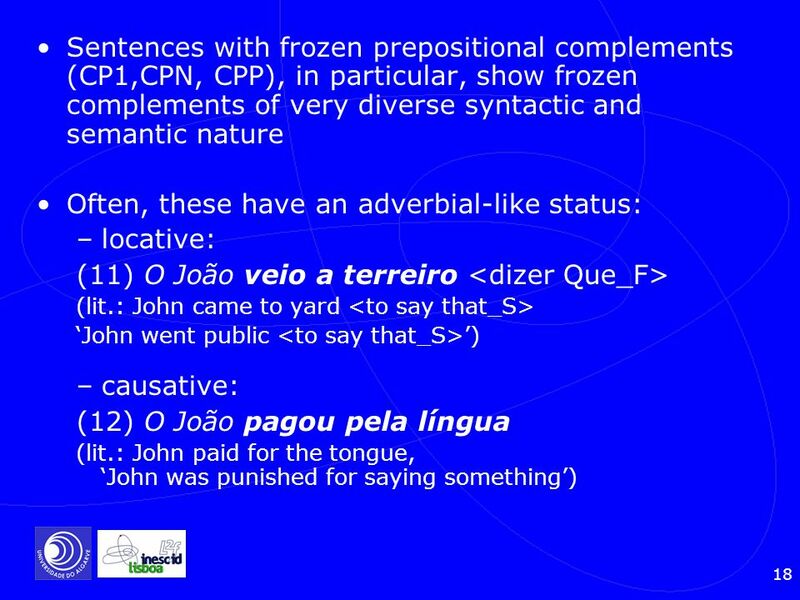 Many sentences were checked against corpora of different nature, using the Linguateca resources ( .pt), and web browsers. 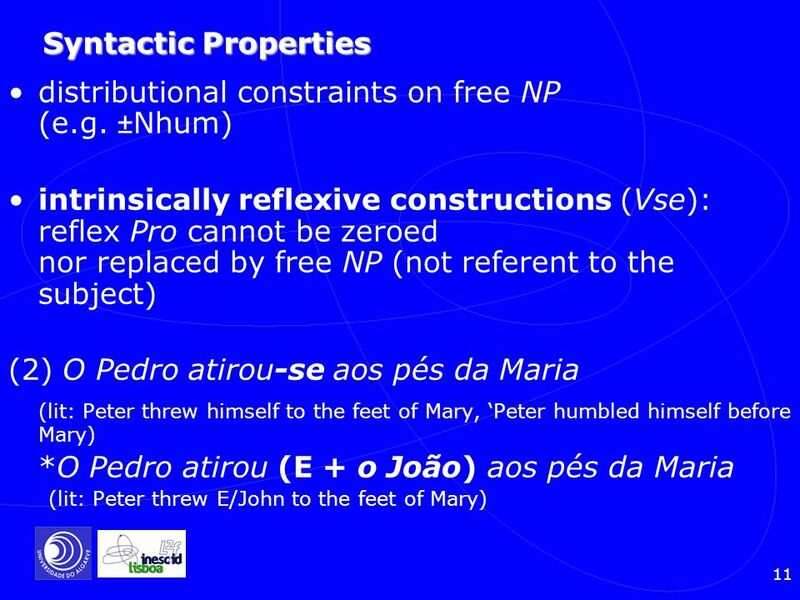 no easy definition heterogeneous expressions Frozen sentences are elementary sentences where the main verb and at least one of its argument noun-phrases are distributionally constraint, and usually the global meaning of the expression cannot be calculated from the individual meaning of its component elements when they are used independently (M. Gross 1982, 1989, 1996; G. Gross 1996; Baptista et al 2003; Ranchhod 2003). 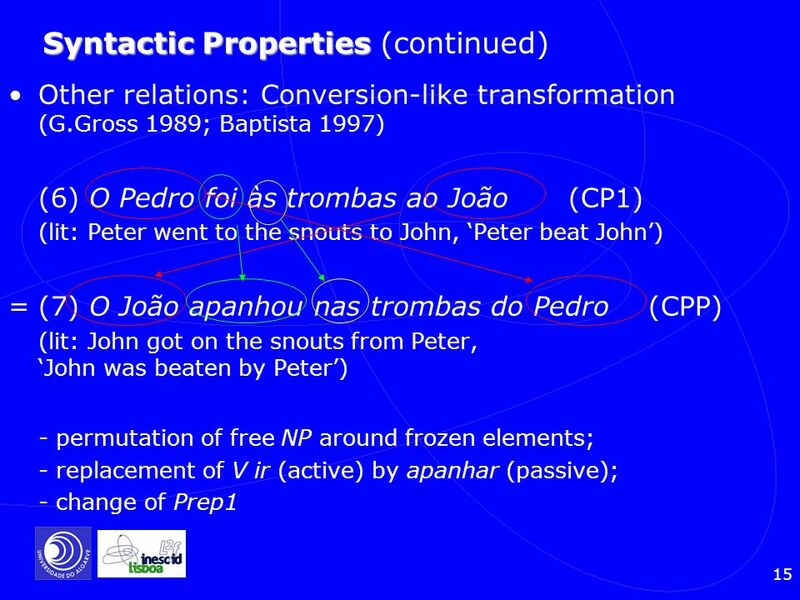 Structure Example Size C1 N0 V C1 O Pedro matou a galinha dos ovos de ouro 800 CAN N0 V (C de N)1 = C1 a N2 O Pedro arrefeceu os ânimos (de Maria =à Maria) 200 CDN N0 V (C de N)1 O Pedro queria a cabeça da Maria 100 CP1 N0 V Prep C1 O Pedro bateu com a porta 900 CPN N0 V Prep (C de N)1 O Pedro foi aos cornos do João C1PN N0 V C1 Prep N2 O Pedro arrastou a asa à Maria 400 CNP2 N0 V N1 Prep C2 O Pedro tirou o relógio do prego 350 C1P2 N0 V C1 Prep C2 O Pedro deitou mãos à obra CPP N0 V Prep C1 Prep C2 O Pedro foi de cavalo para burro CPPN N0 V C1 Prep C2 Prep C3 O Pedro deitou o bebé fora com a água do banho 50 Total 3,500 Frozen sentences with sentential subjects (C0Q, C5) or objects (C6), or with frozen subject noun phrases (C0) were not considered in this paper. 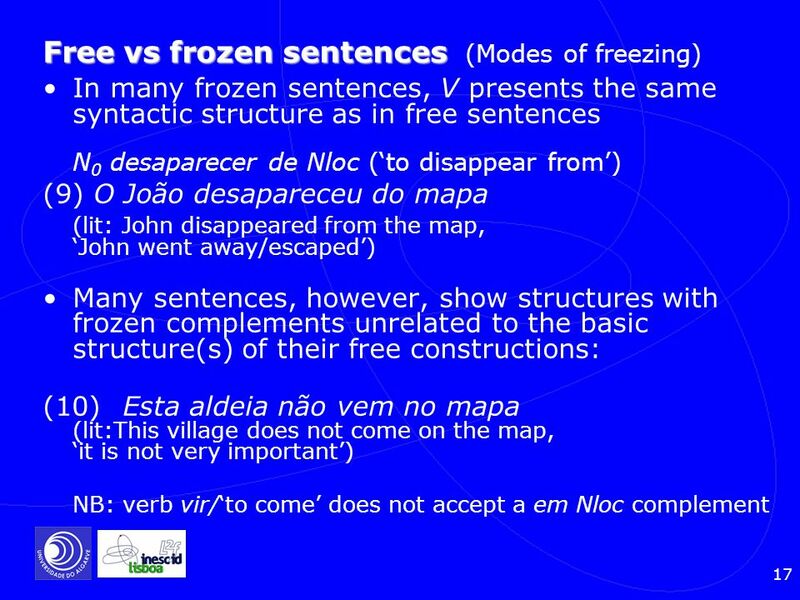 N and C stand for free or frozen noun phrases, respectivelly; N0 is the subject, N1 , N2 and N3 the first, second and third complement; V is the verb and Prep a preposition. 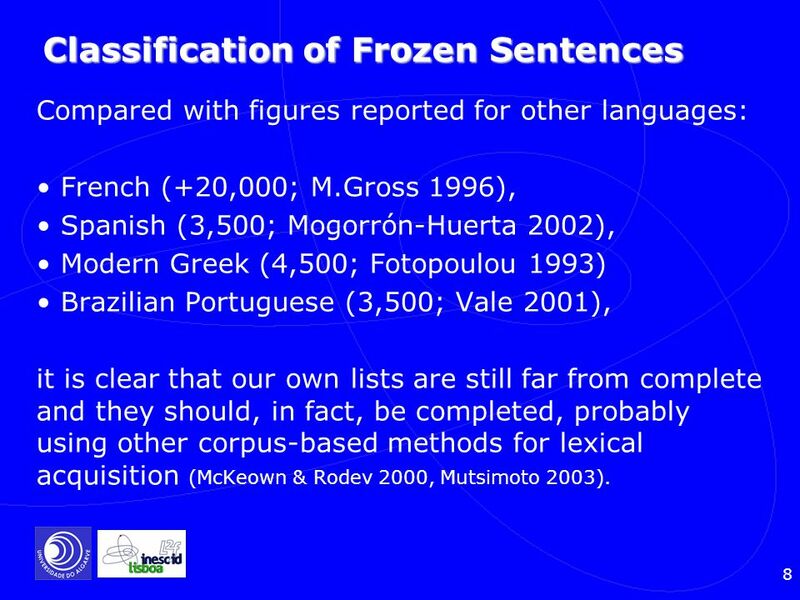 Compared with figures reported for other languages: French (+20,000; M.Gross 1996), Spanish (3,500; Mogorrón-Huerta 2002), Modern Greek (4,500; Fotopoulou 1993) Brazilian Portuguese (3,500; Vale 2001), it is clear that our own lists are still far from complete and they should, in fact, be completed, probably using other corpus-based methods for lexical acquisition (McKeown & Rodev 2000, Mutsimoto 2003). 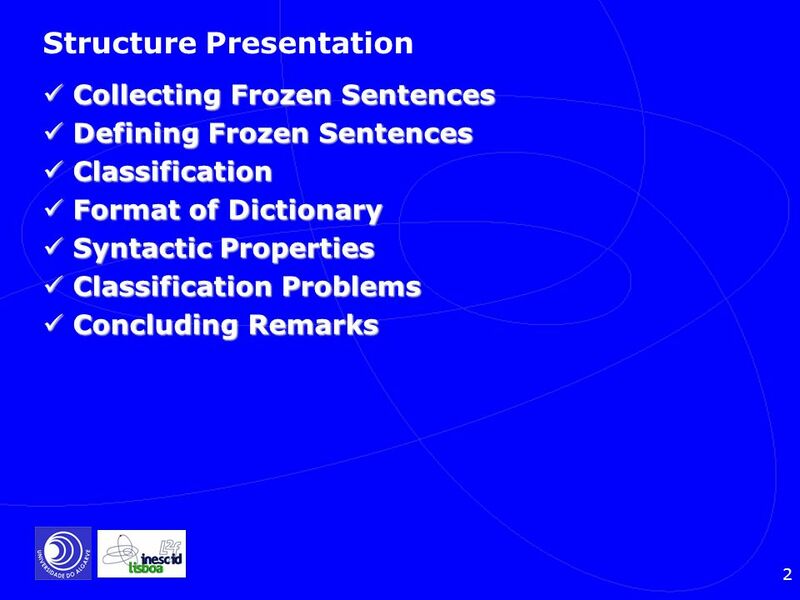 9 Format of Dictionary The Lexicon-Grammar may be viewed as an electronic dictionary of frozen sentences. The electronic dictionary is composed of several matrices, one per formal class. 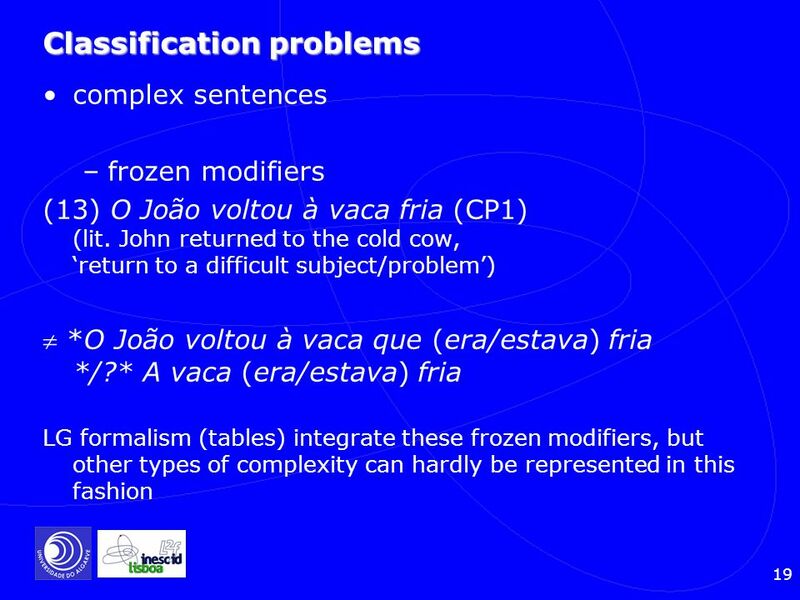 In these matrices, each line is a frozen sentence and the columns contain the lexical elements of the sentence and their syntactic (distributional and transformational) proper-ties. 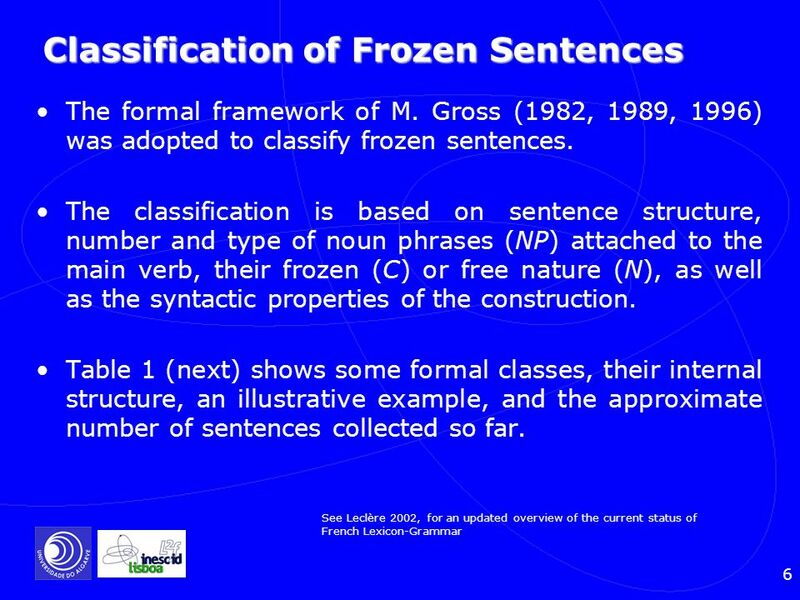 The set of matrices constitutes the lexicon-grammar of frozen sentences. 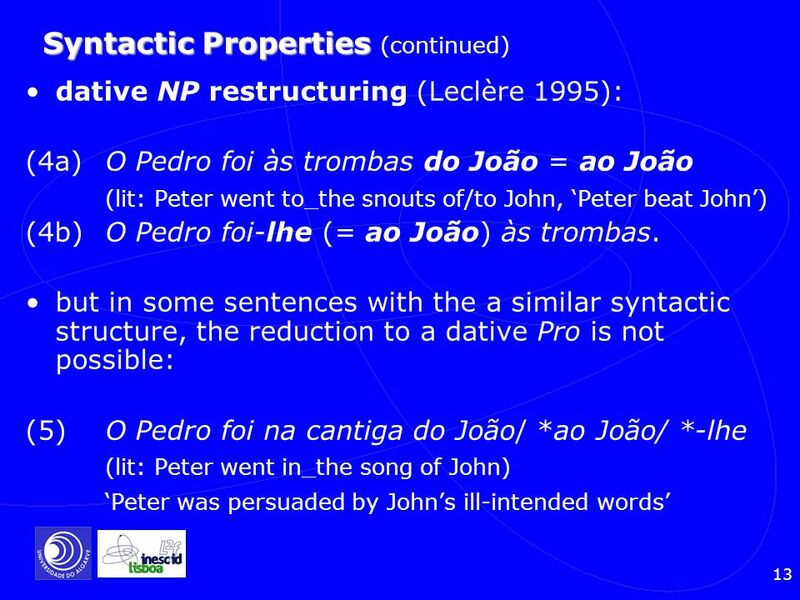 reduction of free NP to an oblique pronoun and reduction of de N to a possessive pronoun: (5) O Pedro foi na cantiga do João [Pro_Obl]= O Pedro foi na cantiga dele [Pro_Pos]= O Pedro foi na sua cantiga but in some cases, the reduction to a possessive is blocked: (4) O Pedro foi às trombas do João [Pro_Obl]= ? 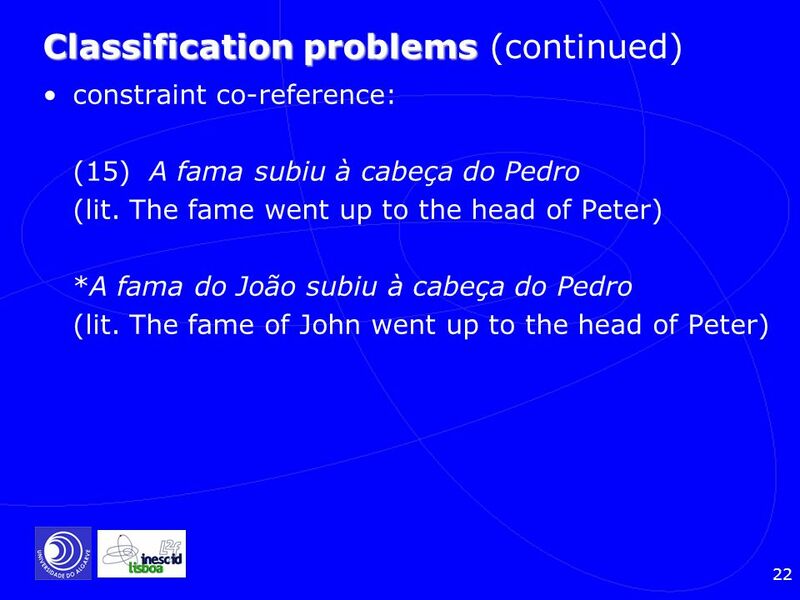 O Pedro foi às trombas dele [Pro_Pos]= *? O Pedro foi às suas trombas. 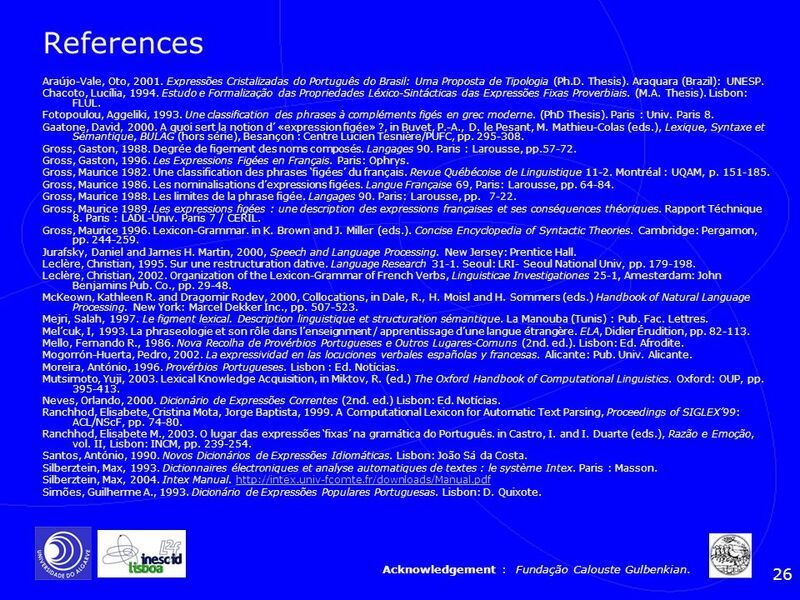 26 References Acknowledgement : Fundação Calouste Gulbenkian. Araújo-Vale, Oto, Expressões Cristalizadas do Português do Brasil: Uma Proposta de Tipologia (Ph.D. Thesis). Araquara (Brazil): UNESP. 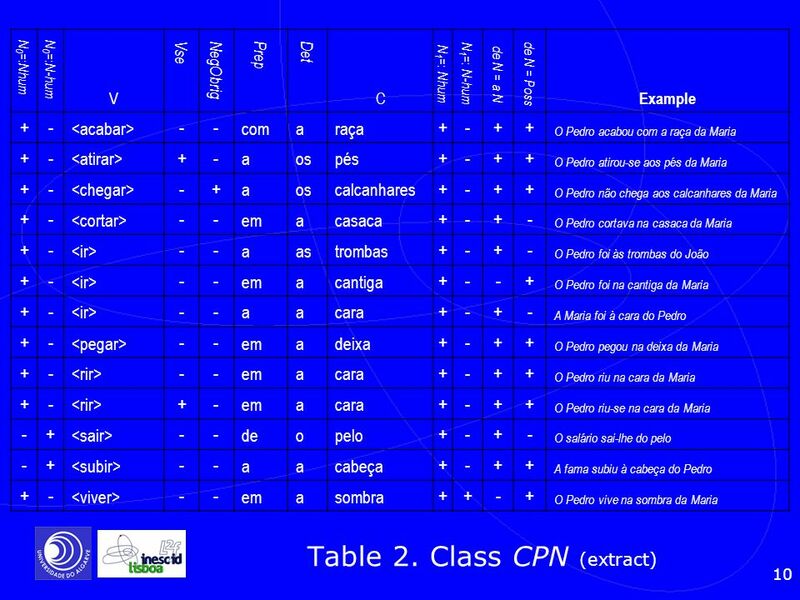 Chacoto, Lucília, Estudo e Formalização das Propriedades Léxico-Sintácticas das Expressões Fixas Proverbiais. (M.A. Thesis). Lisbon: FLUL. Fotopoulou, Aggeliki, Une classification des phrases à compléments figés en grec moderne. (PhD Thesis). Paris : Univ. Paris 8. Gaatone, David, A quoi sert la notion d’ «expression figée» ?, in Buvet, P.-A., D. le Pesant, M. Mathieu-Colas (eds. ), Lexique, Syntaxe et Sémantique, BULAG (hors série), Besançon : Centre Lucien Tesnière/PUFC, pp. 295‑308. Gross, Gaston, Degrée de figement des noms composés. Langages 90. Paris : Larousse, pp Gross, Gaston, Les Expressions Figées en Français. Paris: Ophrys. Gross, Maurice Une classification des phrases ‘figées’ du français. Revue Québécoise de Linguistique Montréal : UQAM, p. 151‑185. Gross, Maurice Les nominalisations d’expressions figées. Langue Française 69, Paris: Larousse, pp. 64‑84. Gross, Maurice Les limites de la phrase figée. Langages 90. Paris: Larousse, pp Gross, Maurice Les expressions figées : une description des expressions françaises et ses conséquences théoriques. Rapport Téchnique 8. Paris : LADL-Univ. Paris 7 / CERIL. Gross, Maurice Lexicon-Grammar. in K. Brown and J. Miller (eds.). Concise Encyclopedia of Syntactic Theories. Cambridge: Pergamon, pp. 244‑259. Jurafsky, Daniel and James H. Martin, 2000, Speech and Language Processing. New Jersey: Prentice Hall. Leclère, Christian, Sur une restructuration dative. Language Research Seoul: LRI- Seoul National Univ, pp. 179‑198. Leclère, Christian, Organization of the Lexicon-Grammar of French Verbs, Linguisticae Investigationes 25-1, Amesterdam: John Benjamins Pub. Co., pp. 29‑48. 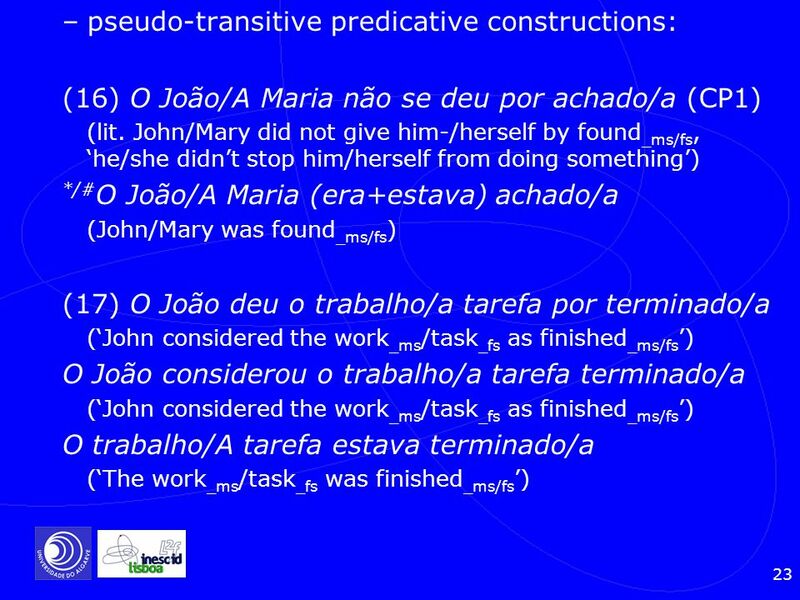 McKeown, Kathleen R. and Dragomir Rodev, 2000, Collocations, in Dale, R., H. Moisl and H. Sommers (eds.) Handbook of Natural Language Processing. New York: Marcel Dekker Inc., pp Mejri, Salah, Le figment lexical. Description linguistique et structuration sémantique. La Manouba (Tunis) : Pub. Fac. Lettres. Mel’cuk, I, La phraseologie et son rôle dans l’enseignment / apprentissage d’une langue étrangère. ELA, Didier Érudition, pp Mello, Fernando R., Nova Recolha de Provérbios Portugueses e Outros Lugares-Comuns (2nd. ed.). Lisbon: Ed. Afrodite. Mogorrón-Huerta, Pedro, La expressividad en las locuciones verbales españolas y francesas. Alicante: Pub. Univ. Alicante. Moreira, António, Provérbios Portugueses. Lisbon : Ed. Notícias. Mutsimoto, Yuji, Lexical Knowledge Acquisition, in Miktov, R. (ed.) The Oxford Handbook of Computational Linguistics. Oxford: OUP, pp. 395‑413. Neves, Orlando, Dicionário de Expressões Correntes (2nd. ed.) Lisbon: Ed. Notícias. 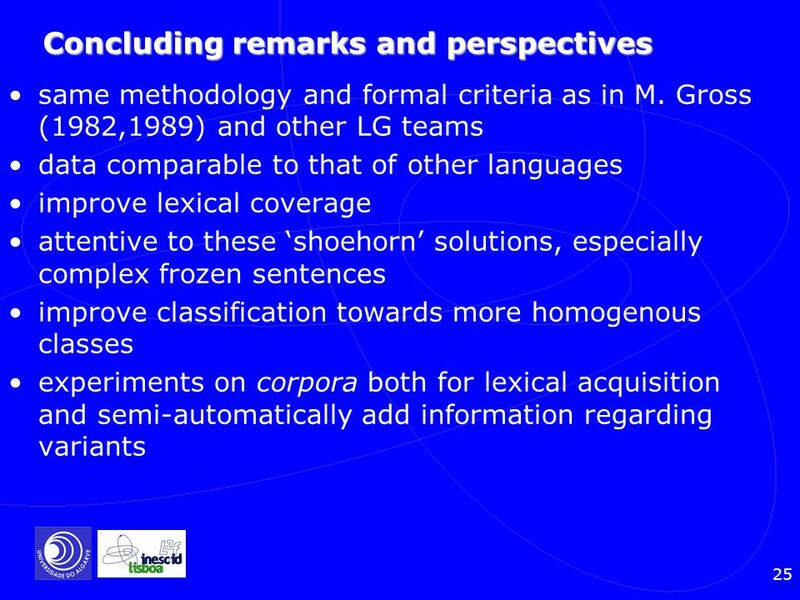 Ranchhod, Elisabete, Cristina Mota, Jorge Baptista, A Computational Lexicon for Automatic Text Parsing, Proceedings of SIGLEX’99: ACL/NScF, pp. 74‑80. 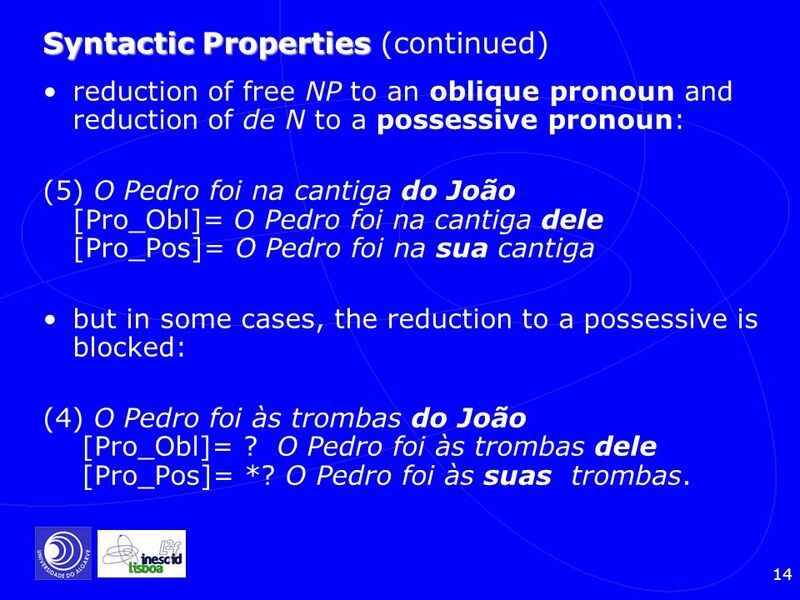 Ranchhod, Elisabete M., O lugar das expressões ‘fixas’ na gramática do Português. in Castro, I. and I. Duarte (eds. ), Razão e Emoção, vol. II, Lisbon: INCM, pp. 239‑254. 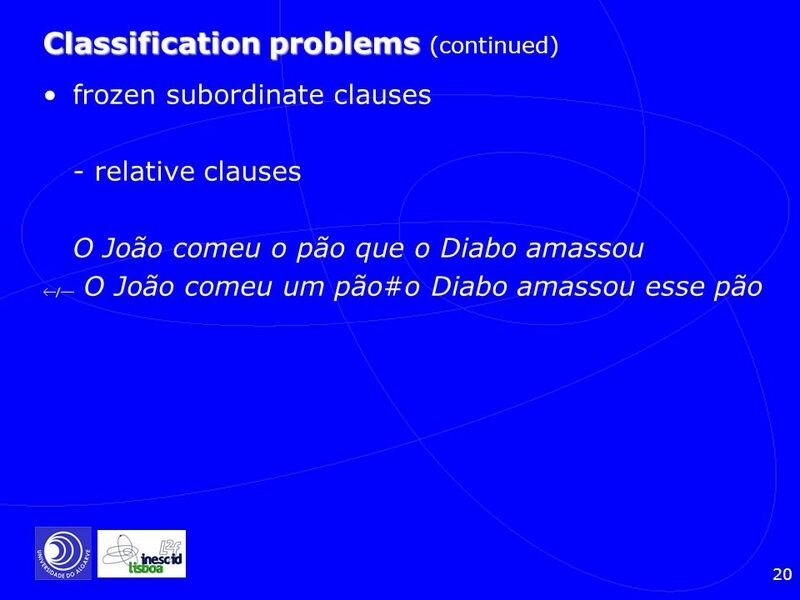 Santos, António, Novos Dicionários de Expressões Idiomáticas. Lisbon: João Sá da Costa. Silberztein, Max, Dictionnaires électroniques et analyse automatiques de textes : le système Intex. Paris : Masson. Silberztein, Max, Intex Manual. Simões, Guilherme A., Dicionário de Expressões Populares Portuguesas. Lisbon: D. Quixote. 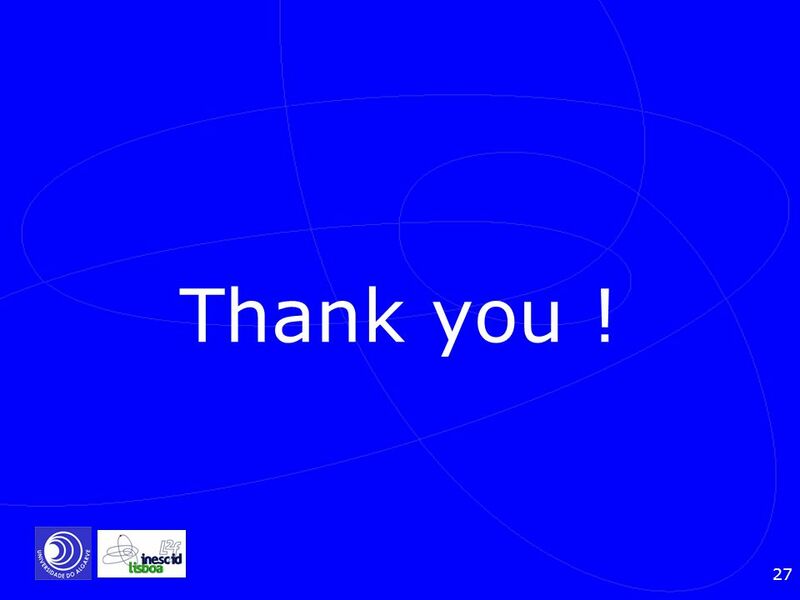 Acknowledgement : Fundação Calouste Gulbenkian. 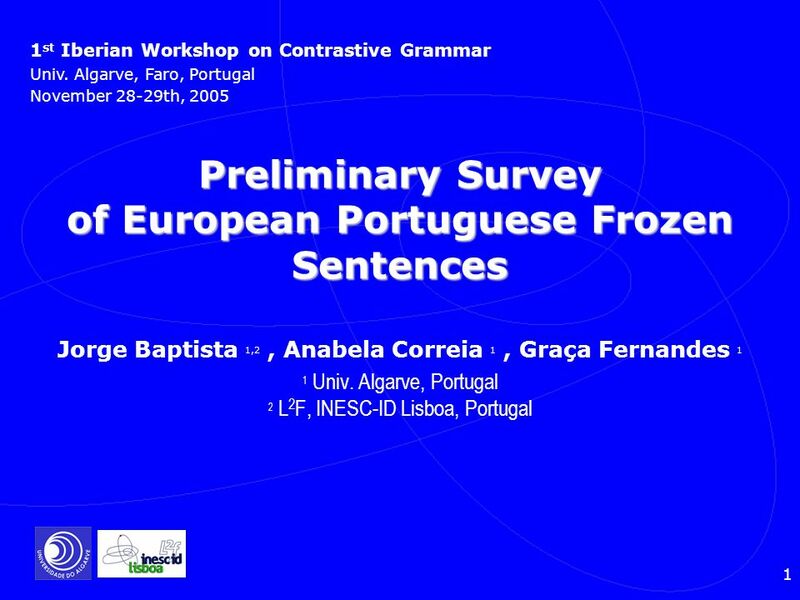 Carregar ppt "Preliminary Survey of European Portuguese Frozen Sentences"
Tópicos Especiais em Aprendizagem Reinaldo Bianchi Centro Universitário da FEI 2012.